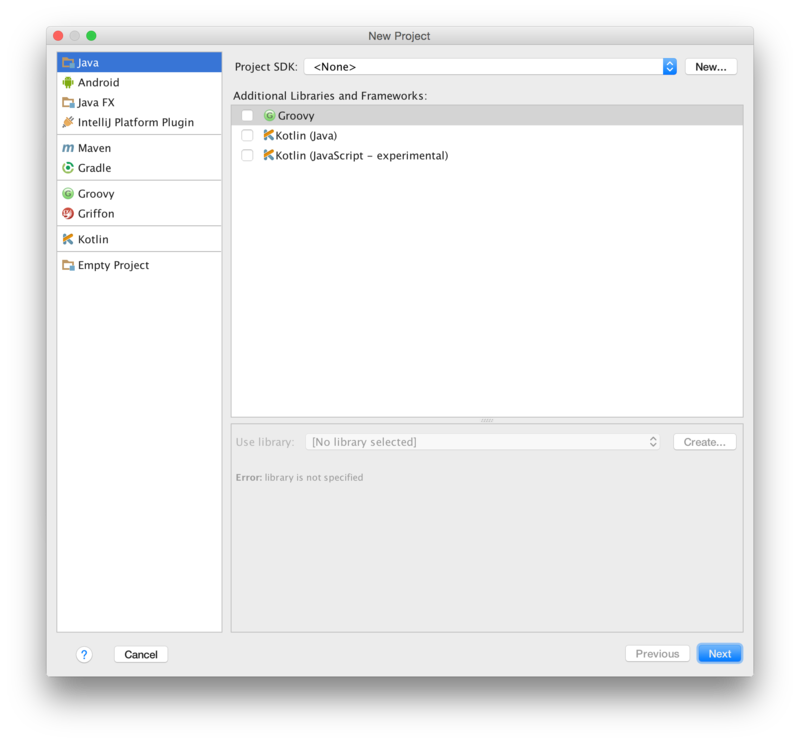 With this post I'll show you how to create a new Xtext project in IntelliJ IDEA. I show you how to compile and start editors tailored to your languages for testing. 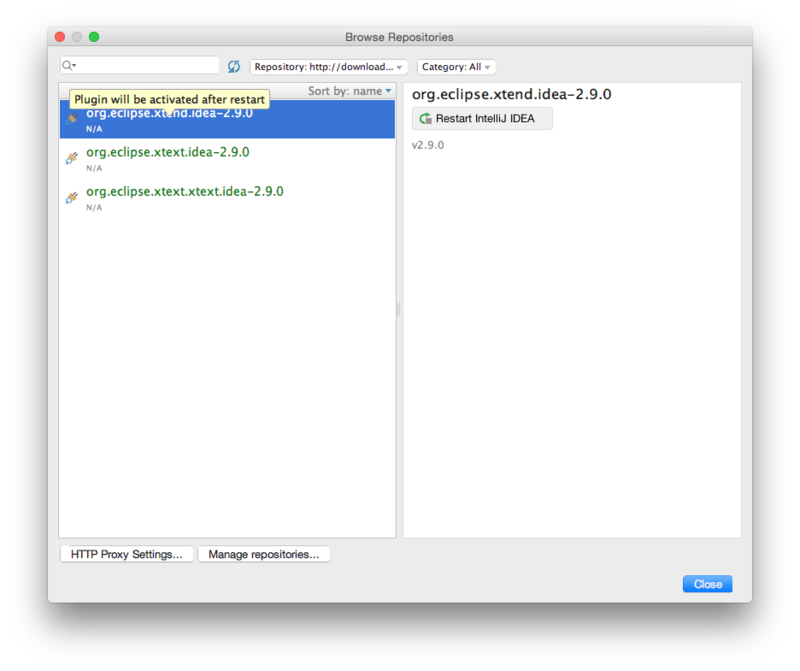 Within IDEA Xtext offers the creation of such language-specific editors for the IntelliJ IDEA platform as well as in web browsers. But before we get started, download IDEA, and install Xtext from one of our update sites. If you're familiar with that you may skip the following part and continue with creating a new Xtext project. 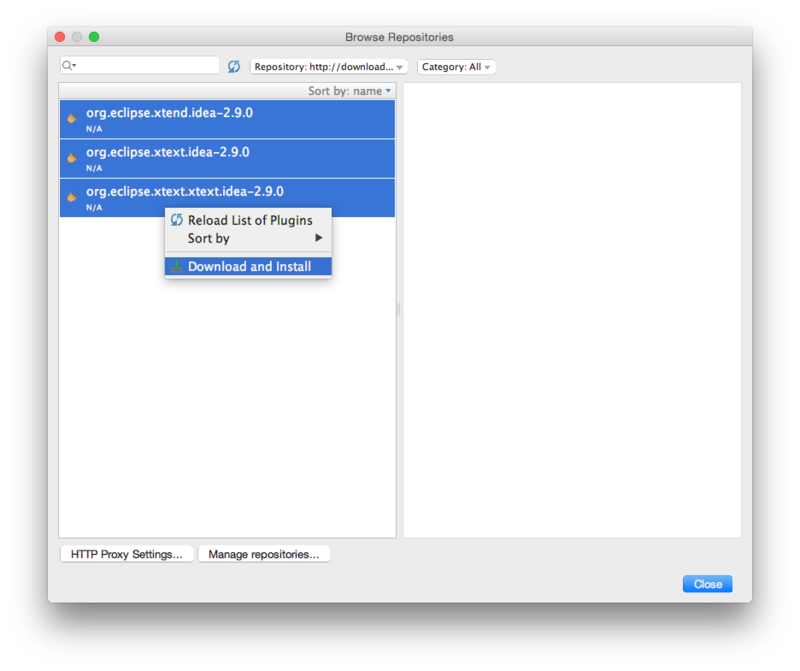 Start IDEA and open the Plugins dialog via the Configure menu. … and enter the update site of your choice. 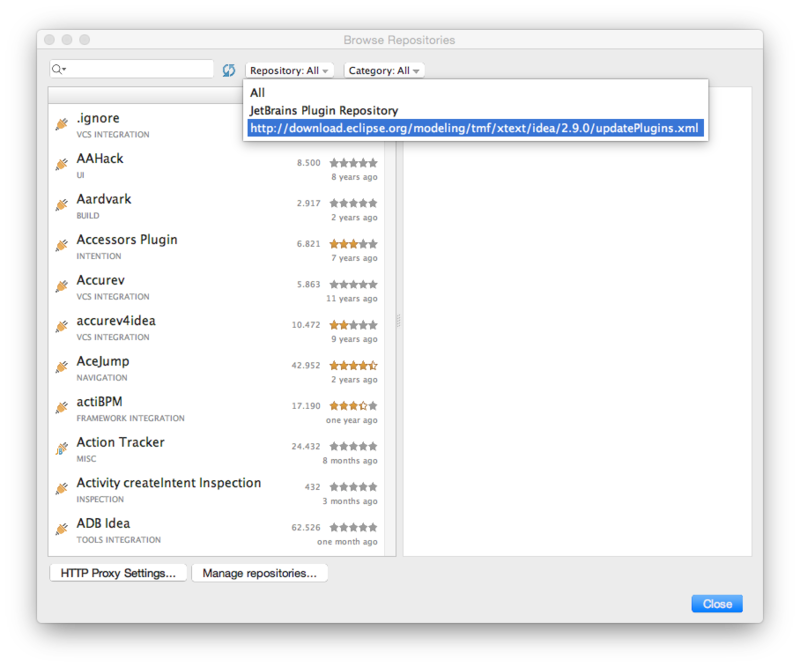 … select all the offered plugins, and hit Download and Install. Once the installation is done restart IDEA, e.g. 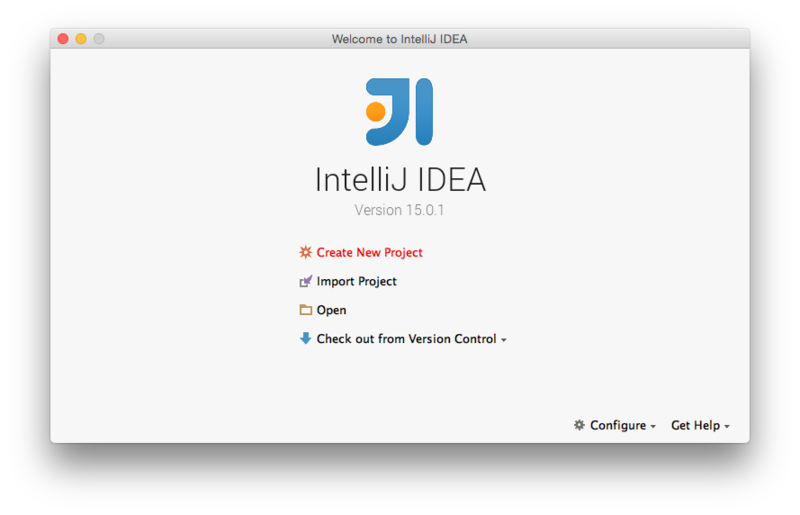 by selecting one of the plugins and hitting Restart IntelliJ IDEA. Start the Xtext project wizard by selecting Create New Project. Select Xtext in the list on the left. Choose you favorite Java SDK, check the Web integration and Testing support for this tutorial, keep remaining settings, and go the next page. Change the Project Name to org.xtext.example.mydsl, and finish. Gongrats! Your first Xtext project is set up, now. Find the generated grammar stub within the sub project org.xtext.example.mydsl → src → main → java → org.xtext.example.mydsl, as shown in the screen shot below. The generation of your DSL-specific parser and editor infrastructure can be easily invoked by means of our dedicated Gradle extensions. 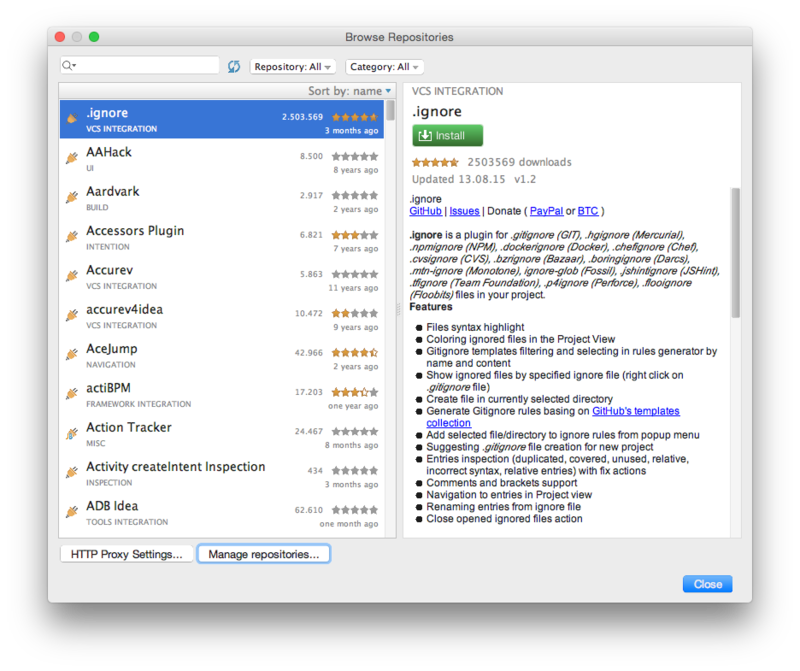 Hence, open the Gradle projects view, e.g. via the magic button in the lower left corner of the IDE. Make sure to have an active Internet connection and access to the JCenter artifact repository, since required artifacts will be downloaded during the first run. Make also sure to have Gradle working in online mode, which can be set in Preferences… → Build, Execution, Deployment → Build Tools → Gradle by unchecking Offline work. 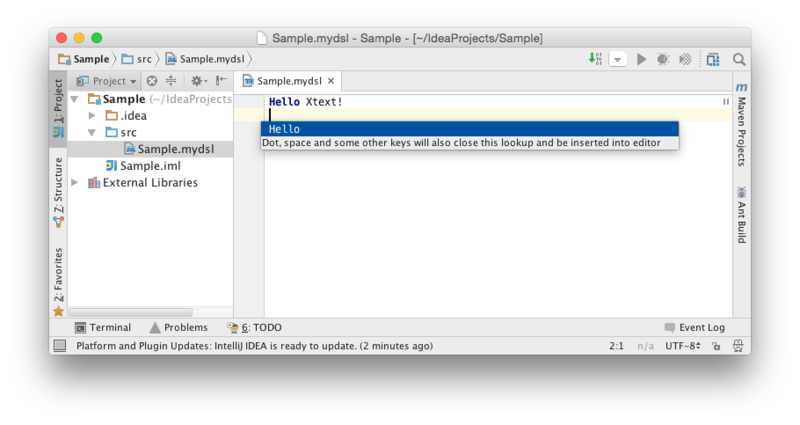 Expand the items named org.xtext.example.mydsl.parent → Tasks → intellij idea and hit runIdea. 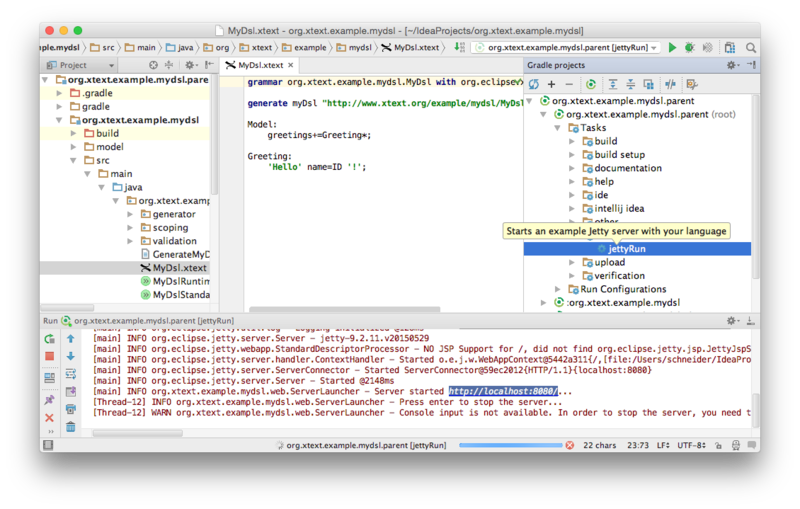 Once the test IDE is loaded create a new project, e.g., a Java project. 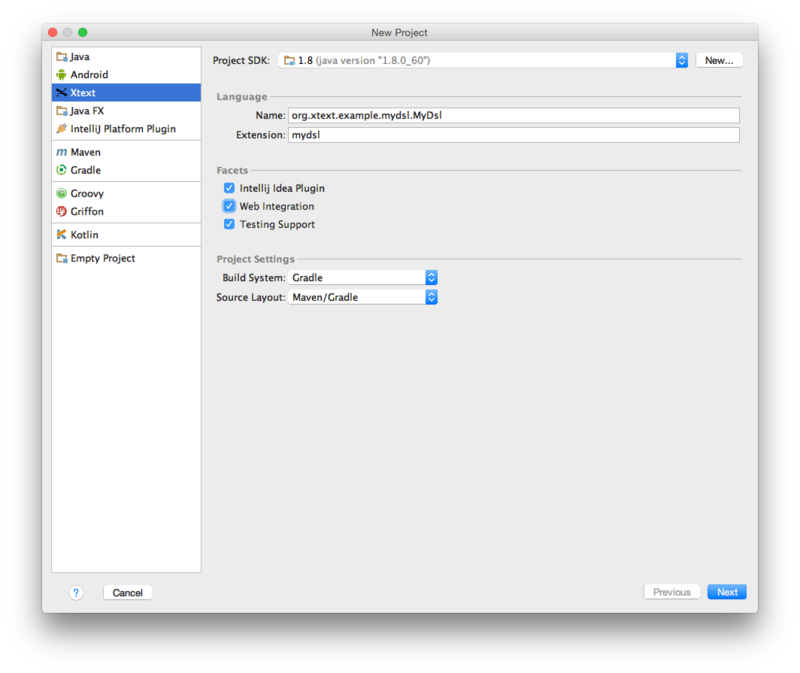 You may skip the determination of the SDK to be used and proceed to the prompt of the project name. Let’s call the project Sample. 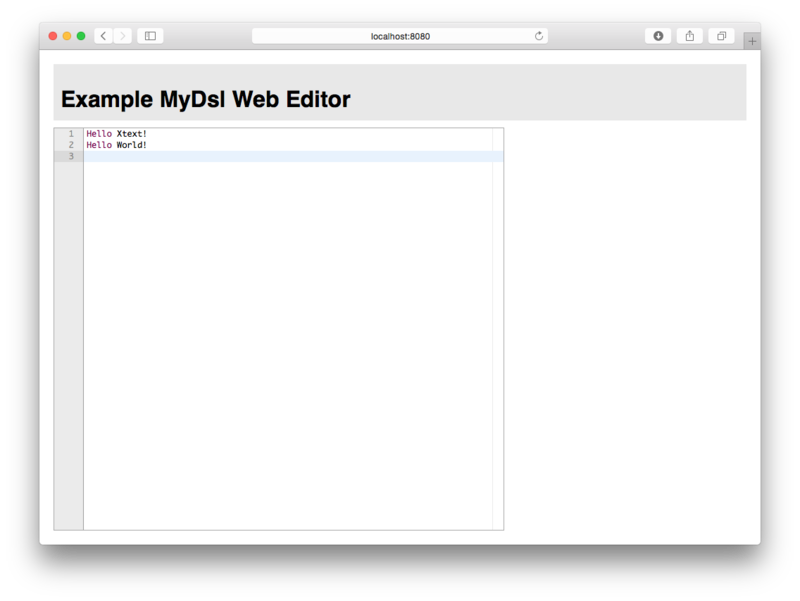 Once your project is set up create a plain file named Sample.mydsl in the src folder, and your DSL editor is opened. Enter the example text below, check out the content assist (CTRL/CMD + Space) as well as the live validation offered by the editor. For testing the web editor a local web server needs to be started. That can be launched by means of the Gradle build system, too. Thus, open the Gradle projects view as shown above. Again, make sure to have an active Internet connection and access to the JCenter artifact repository, since required artifacts will be downloaded during the first run. Make also sure to have Gradle working in online mode, which can be set in Preferences… → Build, Execution, Deployment → Build Tools → Gradle by unchecking Offline work. Expand the items named org.xtext.example.mydsl.parent → Tasks → run and hit jettyRun. A bunch of required components is downloaded first, and after successful compilation a Jetty web server is launched. It is accessible via the URL printed in the Run tool view. Check out the content assist by hitting Ctrl/Cmd + Space. To stop the web server hit the red stop button on left of the Run tool view of IDEA or go to IDEA’s main menu → Run → Stop. In your first five minutes with Xtext and IDEA, you have learned how to create a valid set of projects for building editors for your DSLs. 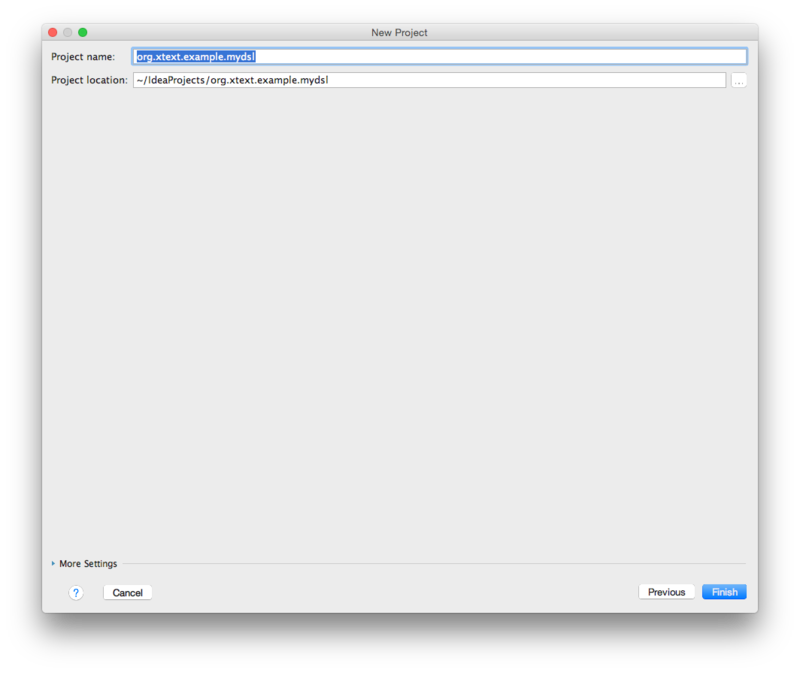 You have run Xtext’s code generation and compilation by means of the Gradle build system. That allows you to test the generated editors implementing your DSLs. Next up you should go through the more comprehensive Domain Model Example. It explains the different concepts of the Xtext grammar language and illustrates how to customize various aspects of the language.